MINTONS" [inscribed on a label placed across a globe with a crown above] / "ENGLAND". Inscription printed in crimson: "GEORGE IV. / Born Augt.12.1762, proclaimed King of Engld.Jan.31.1820." This example was given by Minton to the V&A in 1908 although depicts subjects from nearly 90 years earlier. Tile of porcelain transfer-printed in crimson with a bust portrait of Queen Caroline, Minton & Co., Stoke-on-Trent, 1900-1908. 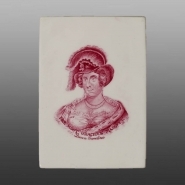 Tile of porcelain transfer-printed in crimson with a bust portrait of George IV. Maker's mark "MINTONS" [inscribed on a label placed across a globe with a crown above] / "ENGLAND". Inscription printed in crimson: "GEORGE IV. / Born Augt.12.1762, proclaimed King of Engld.Jan.31.1820." This example was given by Minton to the V&A in 1908 although depicts subjects from nearly 90 years earlier.